My friend, Melissa Erickson, had a treasured 30 year old baby quilt. She took it with her to college and to Europe when she went to play professional basketball abroad. Melissa’s quilt was made for her by her godmother. She was recently asked to be baby Coco’s godmother and decided to pass her baby quilt to her new godchild. She called me and asked if I would update her baby quilt for Coco. Coco is the daughter of one of her dear friends. 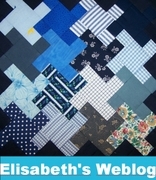 Melissa’s quilt was made from squares of a synthetic fabric, probably polyester. The white squares were made of brushed nylon and these were the only parts that were too worn to be used in the new quilt. The quilt was in amazing condition considering all the love it had received over 30 years. I took Melissa’s quilt apart. 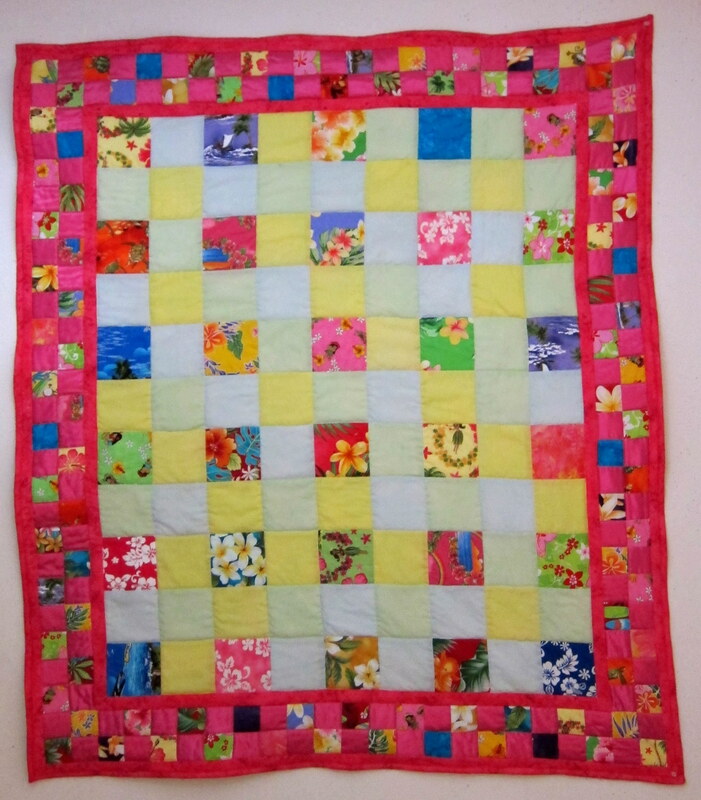 When I sewed it back together I added some squares of Hawaiian fabrics to the pastel colored squares from the original quilt. When I made the border I alternated squares of flannel backed satin (available at Joann’s) with squares of Hawaiian fabrics. I used a cuddle fabric (similar to Minkie) for the quilt back. 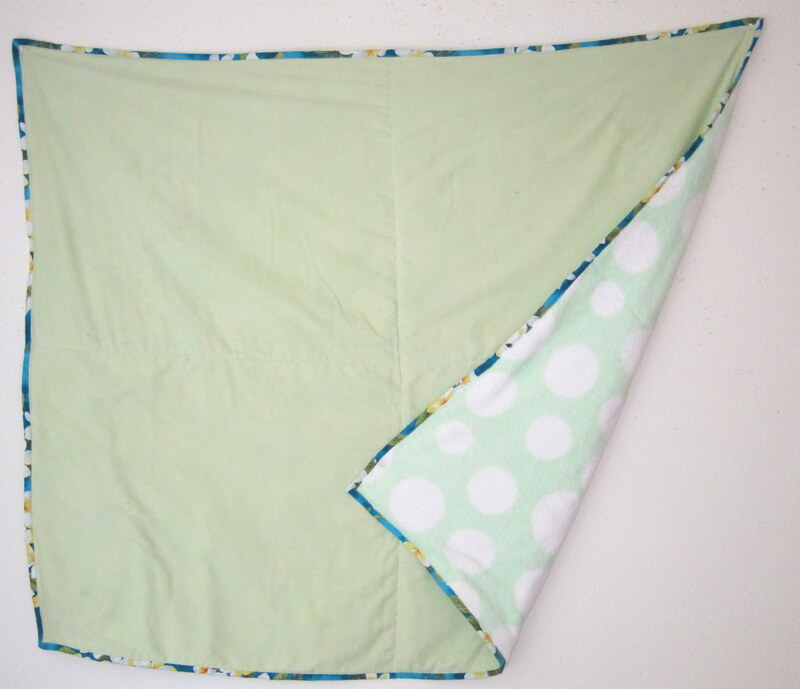 The original quilt had been sewn together with a cotton/poly blend thread that lasted in perfect condition. 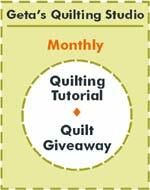 I may rethink using cotton thread in future quilts. Of course I have thousands of yards of cotton thread which I will use up first. I hope the new quilt will last another 30 years. I knew Melissa would miss her baby quilt. I took the backing for her quilt, added the same backing I had used on Coco’s quilt and a Hawaiian fabric binding so she could have at least part of her original quilt back to love. 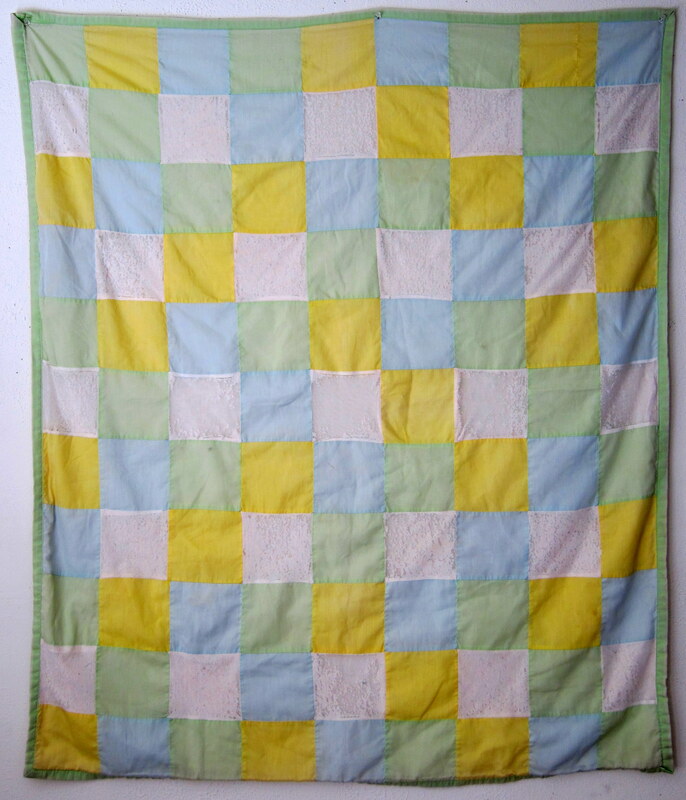 In 2008 I made another quilt for Melissa. You can check out the pattern here.